The Program feature is still in its BETA phase in Portfolio for JIRA . While you're using the BETA release, do let us know how we can improve this feature by clicking the give feedback link in the Program page of Portfolio for JIRA. A program provides you with an aggregated view to track status and progress across multiple plans. Programs let you see how deliverables and releases align across work streams, and aggregate scope data into high-level scope tables and schedule views. Programs and plans in Portfolio for JIRA are different in the sense that they display information at different levels of granularity. Plans let you aggregate issues, teams, and releases to calculate your project schedules. The information contained in plans can be too granular when you just want to keep track of work that's across multiple teams. Programs, on the other hand, give you high-level visibility of long-term initiatives that are spread across multiple plans and teams. By configuring your program to use information contained in a single or multiple plans, your program then provides an overview of how individual teams are tracking towards your initiatives. Schedule view, which is an aggregated schedule of the issues in the plans existing in the program. You can configure this view to display the initiatives of a single plan or across multiple plans. Scope view, which is a table of issues with data that's aggregated from the individual plans in the program. You can configure this view to display the initiatives of a single plan or across multiple plans. Give feedback about programs by clicking the link. See Creating and deleting programs for more details on how to use programs. The plans in your program must contain issues that are set at the hierarchy level that's higher than epics. 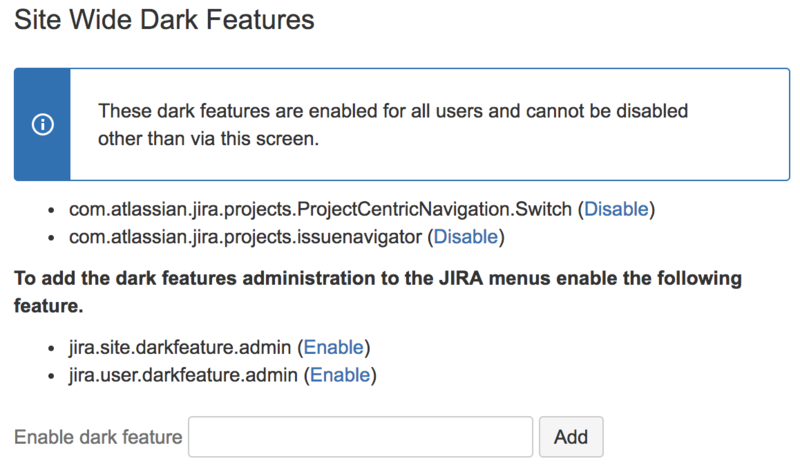 To use the feature during its beta phase, a user with the JIRA administrators global permission will need to configure an additional setting in your JIRA instance. This additional setting is what is known as a dark feature key in JIRA. By enabling programs, the feature will be available to everyone using your JIRA instance. Enabling programs doesn't have any impact on any data in your JIRA projects, or even on your instance database. It just surfaces additional data, in the form of scheduling information in Portfolio for JIRA. Similarly, disabling programs just removes scheduling information from JIRA, and doesn't impact any data in your instance. You can safely enable and disable programs multiple times during the beta phase, as needed. Do not disable any of the other dark features. These are required by your JIRA instance. Log in to your JIRA instance with the JIRA administrators global permission. The 'Site Wide Dark Features' page will display. 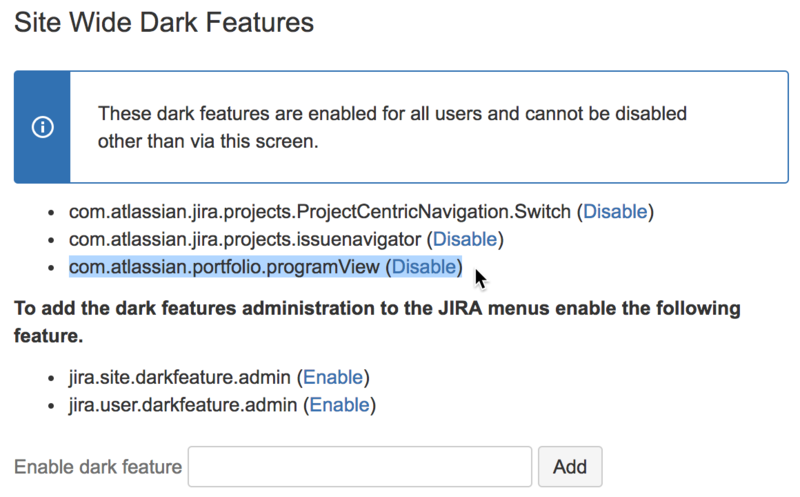 In the 'Enable dark feature' field, enter com.atlassian.portfolio.programView. Click Add. The dark feature key for programs will be displayed in the 'Site Wide Dark Features' page. In the 'Site Wide Dark Features' page, find com.atlassian.portfolio.programView, and click Disable right next to it.